First of all I’d like to say a huge thank you to everyone, this evening we reached over 500 hits, considering that I started this blog just over two weeks ago I consider that an enormous success. So thank you for your huge support and I hope you have all enjoyed my adventures. 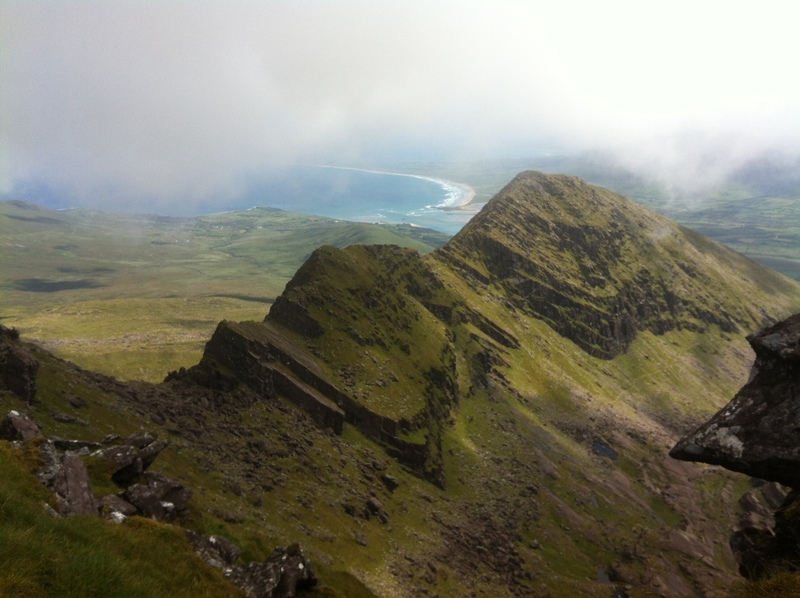 Day 8 of my adventure in Ireland (if you missed it, see day seven here). 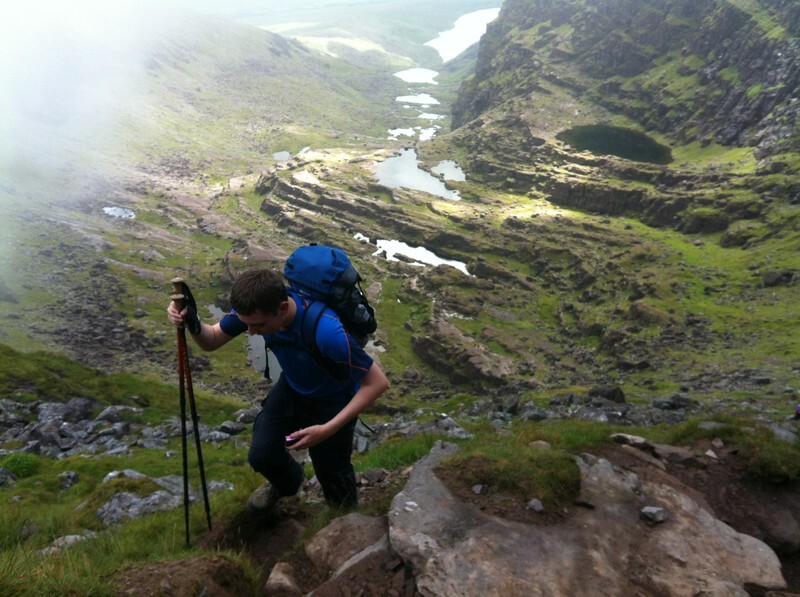 It would of been a great shame to come to County Kerry, a land renown for its mountains, and not climb at least one summit. 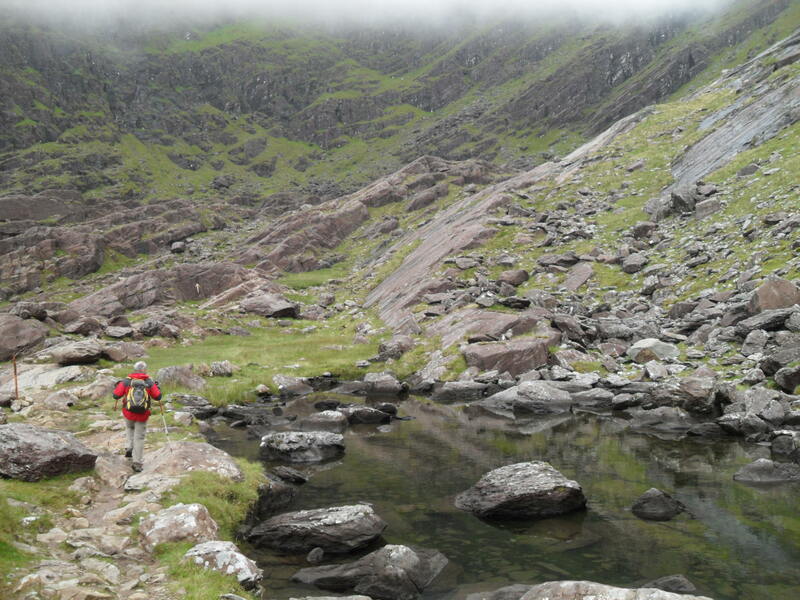 Since arriving in Ireland, my dad and I had been planning on conquering Carrauntoohil (Ireland’s highest peak). Unfortunately the constant cloud had dampen our hopes, but the blue skies of day seven had revived them. On day eight we awoke cautiously, closely examining the weather outside, which appeared to be sun and clear skies. 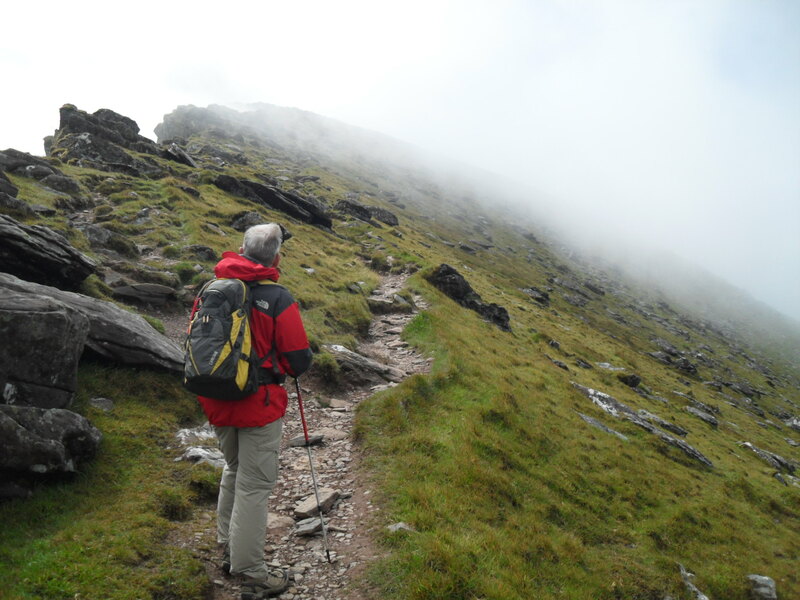 However weather reports stated that low cloud would soon swoop in around Killarney and the MacGillycuddy’s Reeks, so we had a choice, risk the Reeks and getting caught in the cloud or find another mountain elsewhere to climb. Not wanting my experience of the highest point in Ireland to be one submerged by cloud, I voted for the second option. 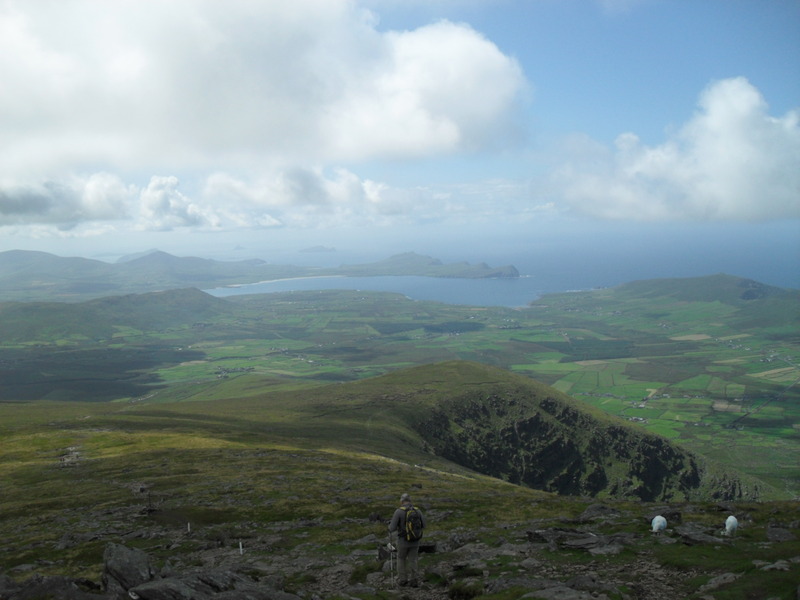 Fortunately the mountain range that ran through Dingle offered a rather tempting peak called Mount Brandon; which, at 3,125 feet, is the highest mountain in Ireland outside the MacGillycuddy’s Reeks. While driving to the village of Brandon on Dingle we were once again greeted by lovely sunshine and I was certain that we had made the right choice. Dropped off in the car park at the foot of Mount Brandon, which was absolutely packed, we began the ascent of our first Irish mountain. To start off with the path to the summit led diagonally across a series of fields at a steep gradient, insuring that dad and I were soon puffing and huffing. However this meant we gained a reasonable amount of height in a short amount of time and soon the path began to even out. After this, the path stretched around the mountainside, just below the ridge line, and walking along it here was rather pleasant; with some excellent views of Brandon Bay. However I found myself gazing up in horror at the summit, at least it would have been the summit if a great amount of cloud hadn’t been obscuring it. In all of Dingle the sky was empty and clear, except for here, where a single vast cloud sat on top of Mount Brandon; unmoving. My heart sank, today would certainly not be the day for taking long shots of the Dingle Peninsular from the summit of its highest mountain, as I had hoped it would be. Nevertheless we continued walking, hoping that maybe the cloud would burn away as the day went on. Heading onward to the glen, I seemingly found myself transported back to Jurassic times, as a valley of jagged rocks and Patornoster lakes lay before us. The cloud quickly descended and we found ourselves in a thin fog obscuring the view around us. The silence was occasionally broken by the sounds of walkers somewhere in the fog; an eerie setting. The path led up through a series of rock steps to the bottom of seemingly sheer mountain face that rose imposingly before us. As we approached though we could just make out the little scree path that climbed steeply upwards, winding its way up the mountain. 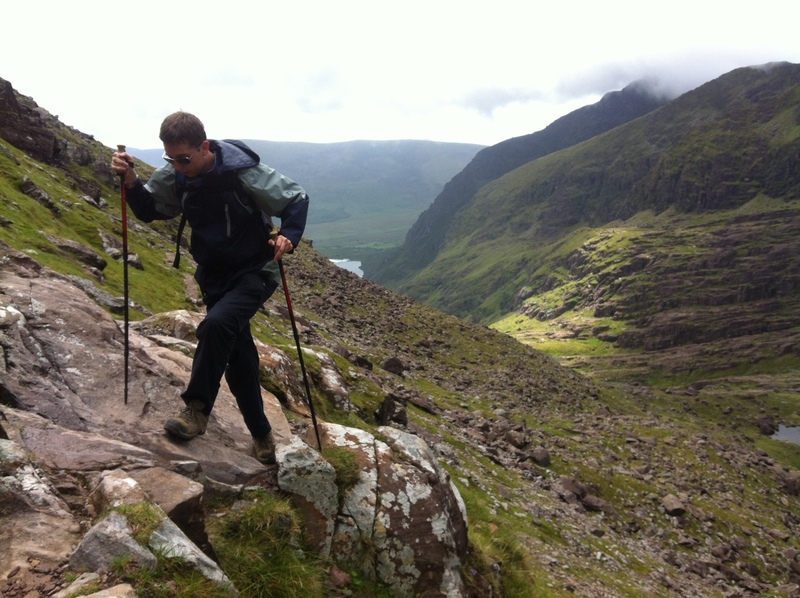 Honestly this is perhaps the scariest walk I’d ever done, more so than even the ridge walks like Crib Goch and Bristly Ridge which I have done. The scree was loose and very eroded, this, combined with extraordinary steepness of the route, made it an easy slipping hazard with a significant drop on the other side. The route felt very exposed, but the worse thing was the constant crowds of other walkers, coming up and down the route. I was shocked when people, with little patience, were barging past me as I stood near the edge of steep 20ft drop. Fell runners and others were constantly kicking down stones and scree on top of us, as they raced around above and we had to constantly stop to let others edge their way down the mountain or charge up it. After a very nerve-racking forty-five minutes we finally made it to the top of the gully and onto the col. From there it was only a short final walk to the summit and into the thick cloud that surrounded it. We sat down on the summit and ate some lunch, admiring the briefs views of Brandon Bay in between gaps in the rolling cloud. Our original plan had been to come back the way we came, but neither of us wanted to return down the gully, so we instead opted for a different route. 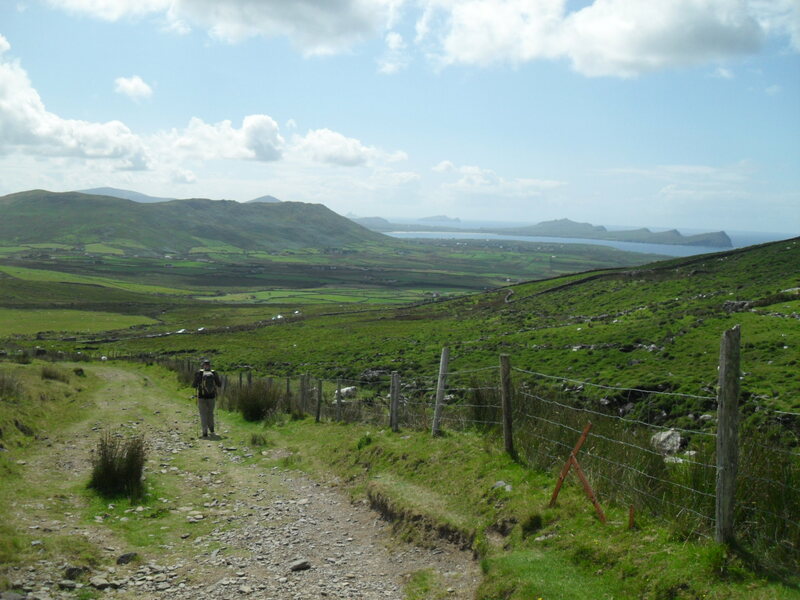 The route we chose, known as the Pilgrim’s Path, stretched down the grassy western side of Mount Brandon, a much gentler place. The track is known as the Pilgrim’s Path because it was a route usually followed by pilgrims attempting to reach summit of Mt Brandon, named after St Brandon who, legend has it ,sailed to the Americas. From the bottom to the top, the path is marked with crosses, guiding the way for travelers lost in the cloud. The route down the Pilgrim’s Path to its end at Ballybrack is an easy but long walk, however as we descended from the clouds a spectacular view of Ireland opened up below us. At the end, our driver (mum) picked us up from the road side and we were both soon snoring our way back to the hotel, with an Irish Munro now under our belts. Also don’t forget to follow me on Twitter and visit me at Google+ for more updates and pictures. Or now check out my Facebook page for much more photos of this day and more. Hello fit person! 🙂 (I’m sorry I don’t know your name) Many of my regular walkers are more in the gentle ramble category so it’s good to find an active youngster (and hello Dad, too!) I could probably manage the Pilgrim’s route and am glad you found a little sunshine. I drove around that peninsula with a friend in a campervan a good few years ago and visibility was severely restricted. Good old Irish rain! It’s a lovely place though, isn’t it? Many thanks for your company. Thanks Jo, let me introduce myself, I’m Callum and thank you for putting up my post, you’ve introduced me to so many other wonderful walkers. Dingle was perhaps my favouirte part of Ireland as it was pretty much the only place where we didn’t get any Irish rain, plenty of Irish cloud though. But it was great descending out of the cloud and being confronted with such a wide reaching view. This reminds me a lot of walking in Scotland! 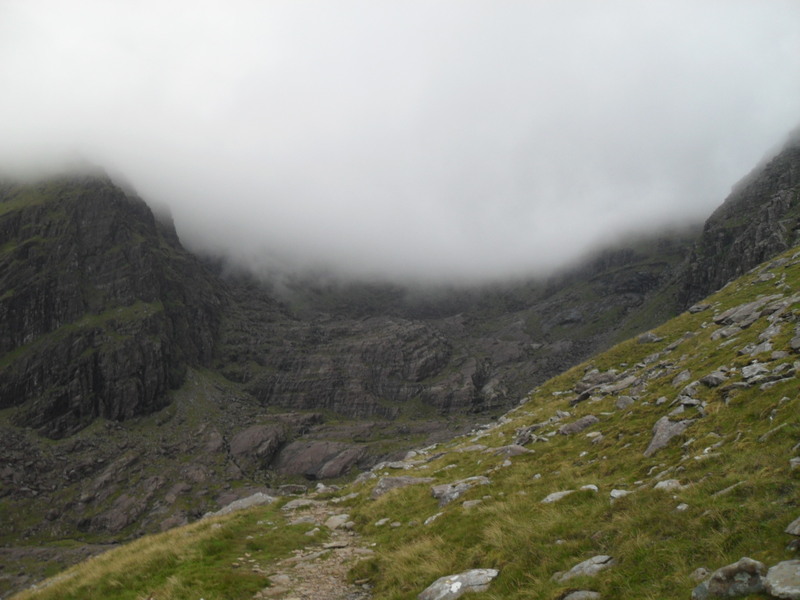 Similar terrain – and weather. However, I hate scree and exposure and would probably have turned back before that bit. Like others, I would have been ok on the Pilgrim’s Path though. And you got a great view in the end! Great photos, despite the clouds, and you are right, Sunday is probably the busiest day on the mountains and hills around these parts. thanks, glad you like them 🙂 From what I’ve learned Brandon is pretty popular on any day of the week but on sunday the number visitors just explodes thanks in part to its popularity with catholic pilgrims.